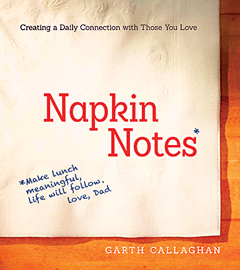 Garth Callaghan is the Napkin Notes Dad, who writes an inspirational note on the napkin in his daughter’s school lunchbox every single day. By the time his daughter, Emma, graduates from high school, he will have written approximately two thousand of these notes, a father’s love letter to his growing daughter, composed over twelve years, one thought a day, one day at a time. Every day. 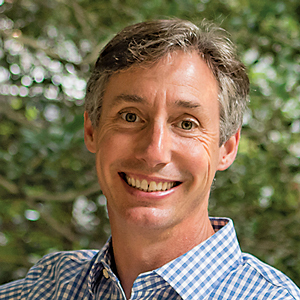 Garth Callaghan started writing napkin notes to connect with his daughter, Emma, when she was in elementary school. Emma started saving the notes when her father received his first cancer diagnosis. Garth Callaghan is the double-cancer dad, diagnosed separately with kidney cancer and prostate cancer in his early forties. His medical hope relies on treatments that scourge his body and sap his stamina. Garth Callaghan is a normal guy, doing his best to be a good dad to his daughter and a good husband to his wife, Lissa. But he’s also on a mission that has more to do with keeping promises than it does with beating cancer. Let’s get the facts of his cancer out of the way first. In November 2011, at the age of forty-two, Garth was diagnosed with kidney cancer. Surgeons removed his kidney, along with a tumor the size of a grapefruit. In the cancer universe, kidney cancer is among the most ruthless. The tumor was gone, but was the cancer? In August of 2012, and completely unrelated to his kidney cancer, Garth was diagnosed with prostate cancer. Pathology reports indicated the prostate cancer was very slow growing, so Garth’s doctors decided not to treat it, especially because kidney cancer was still an open question. Then, in October of 2013, Garth got his answer, in the form of a growth on the adrenal gland next to the kidney that had been removed in 2011. The kidney cancer was doing what it does so effectively, floating in his blood, spreading to other parts of his body. His doctor could not have been more blunt: Mr. Callaghan, you are going to die. In February of this year, six additional growths were located in Garth’s abdomen. Garth’s treatment options are by necessity unconventional. His cancer does not respond to chemotherapy or radiation, so he relies on a medical cocktail with hellish side effects. It seems to be working, kind of, for now. “It’s like playing whack-a-mole,” says Garth of the way they are chasing the growths. Some of the growths have disappeared. Some have gotten smaller. This is all good, but kidney cancer fights dirty. Its five-year survival rate is eight percent. Fighting kidney cancer is exhausting. Beyond exhausting, really. It takes everything you’ve got. How do you win against an opponent that organizes itself in all the places our medical eyes can’t see and fights by rules we don’t understand? Early-morning contemplation yields the napkin note of the day from father to daughter. Garth says, in finding the right words for Emma, he is also finding the right words for himself. The napkin notes story starts way before the cancer story. Seven years before. It begins with a chicken patty on a bun. It was 2004, Emma’s kindergarten year, when Garth realized there were few nutritious options offered by the cafeteria at Emma’s school. So they started packing Emma’s lunches. Not every day, but often. And sometimes Garth would drop a note into the lunch- box. I love you. Or, I hope you have a wonderful day. It wasn’t until second or third grade that the napkin notes became an every-day thing. After a couple of years of passing along his own thoughts, Garth found other sources of inspiration. He began incorporating quotes from “people wiser than me” to convey his thoughts. People like Dr. Seuss: Today you are you that is truer than true. There is no one alive that is youer than you. Or Babe Ruth: It’s hard to beat a person who never gives up. Or C.S. Lewis: Do the right thing even when no one is looking. If there were nothing more to the story, it would still be one worth telling. One lunch at a time. Day after day. Year after year. One father’s devoted way of remaining connected to his daughter, messaging her all the things a parent wants his child to know: that she is loved; that she is capable of wonderful things; that hope and faith and integrity are the building blocks of a life well-lived. But somewhere along the line, the other story began to unfold, as well. Day after day. Year after year. Growing quietly on Garth’s kidney. After Garth’s diagnosis, the napkin notes took on more significance for both daughter and father. Emma began to save the notes, cataloging them in a binder. For Garth, his thoughts more often touched on facing life’s difficulties. One of Garth’s favorite quotes is by Jack Canfield, author of Chicken Soup for the Soul: Everything you want is on the other side of fear. Some days, the other side of fear felt like an awfully long way away. The two stories, Garth’s notes and Garth’s cancer, had inevitably crossed paths, but it wasn’t until they went public that things got a little out of hand. For this next part we have to jump forward in time again, to November of 2013. The Richmond Times Dispatch had run an article about Garth’s napkin notes project, and based on that bump in publicity, Garth set up a Napkin Notes page on Facebook, but the thing wasn’t exactly catching fire. But that same month, Garth had to fly to Orlando, and the in-flight magazine had an article about Alex Sheen, the founder of Because I Said I Would, a social movement dedicated to honoring Alex’s late father by encouraging people to keep the promises they make to one another. It was a simple, humanizing activity that had found an international following. Garth, two weeks out from his third cancer diagnosis, wept as he read the article. He felt it provided an answer to a question he had, perhaps, been as yet unable to ask himself out loud: How do I keep my promise to Emma to always make sure she has a napkin note in her lunchbox? He didn’t know if he would live long enough to see Emma graduate from high school, but he vowed that she would have a napkin note every day. That was his promise to Emma. It was at this moment that Garth became, in his words, a mission-driven dad. 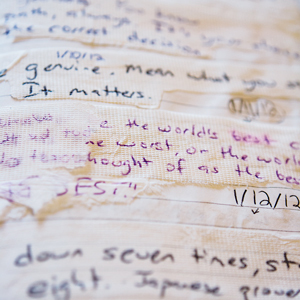 He set out to write 826 napkin notes, one for every school day until the day Emma graduated. He couldn’t guarantee that he would live to see the day, but he could keep his napkin note promise. And then, because Alex Sheen’s story had inspired him, he sent Alex an email, sharing his story and the promise he would keep. The inspiration, it turns out, was mutual, and over the next several months the two struck up a conversation that resulted in Alex blogging about Garth. The blog post went live on January 24, 2014. Within hours, Alex contacted Garth to tell him that the post was trending to be his most popular post ever, and that’s when things exploded. Garth’s book of inspiration is scheduled for release later this month. It was, Garth admits, embarrassing. Suddenly, every incoming line of communication was overwhelmed. His voicemail filled up with messages. The Napkin Notes Facebook page, which had fallen so far short of his thousand-like goal, had 20,000 likes overnight. Garth had to ask for time off from work because the volume of incoming calls was, he felt, becoming a distraction. Over the next several weeks, Garth, Emma, and Lissa made nationally televised appearances on The Today Show, Fox & Friends, and Rachael Ray. They did international interviews with television programs as far away as Sydney, Australia, as well as numerous radio and print interviews for organizations across the world. The paper products giant, Bounty, ran a social media campaign to help raise money for Emma’s college fund. (Garth notes that he did not and does not use Bounty napkins, and offers a hat tip to Bounty for making such an effort on behalf of a non-customer.) Garth gave a TED talk at TEDxRVA. He’s also penned a book, Napkin Notes: Make lunch meaningful, life will follow, published by HarperOne and available the end of this month, that details his journey. Film rights to the book have been optioned by New Line Cinema. He is no longer, as he likes to say, just a guy writing napkin notes. The publicity had provided him with a medium for his mission and his message of Napkin Notes as a way to keep a promise. 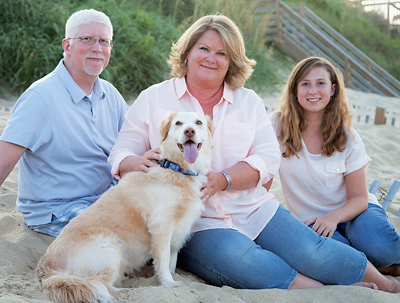 Garth, Lissa, Emma, and Noel (the blonde in front) enjoyed family time this summer. Even the most vigorous hurricane has an eye, a central spot of calm and tranquility, regardless of what is raging immediately beyond its wall. Cancer, in and of itself, is enough of a storm. Add to that the vigor of the napkin notes publicity and the maelstrom kicks up to a nearly ridiculous intensity. The eye of this hurricane is the Callaghan family itself. A recent visit found the family politely making room in a Monday morning for an interview, but other matters were clearly more top-of-mind. It was the first day of volleyball tryouts at Emma’s high school. Preparations were underway for an upcoming family beach trip. It would have been very easy to forget that the man sitting cross-legged on the floor sipping Gatorade and absently petting the family dog is fighting for his life. The Callaghans don’t forget, but they do contextualize. The rest of the stuff on the list? Which brings us back to the frame Garth would place around any discussion of cancer or napkin notes. Emma is fourteen years old now, with all the changes that accompany adolescence. Lissa notes that Emma spends more time in her room with the door closed. Emma has her first boyfriend. She really wishes her teacher hadn’t shown a video of her appearance on Today in front of the entire class. She rolls her eyes at what she describes as her parents’ over-protectiveness. In other words, being with the Callaghan family is just like being with any of a thousand other families. That sense of normalcy in the midst of disease, in the midst of wild publicity, is really, for Garth, at the heart of both the cancer and the Napkin Notes stories. If Lissa and Emma provide the calm at the center of the storm, they also provide the focus at the center of his mission. They are the reason it matters. It is impossible to overlook the impact that Garth’s disease has on the family. Garth has to excuse himself in the middle of an interview to spend a few minutes resting. Lissa, Garth admits, spends a great deal of her time just trying to get Garth to eat because a side effect of Garth’s meds is to destroy his desire for nearly all kinds of foods, and Garth also admits that he is often testy and disagreeable as Lissa tries to keep his body supplied with vital nutrients. In conversation, all three – Garth, Lissa, and Emma – display a similar tendency to thoughtful consideration before speaking. Perhaps this is a shared family trait, or perhaps it is learned from having to answer questions so publicly. Or, most likely, because cancer imposes a level of thoughtfulness on the family. Napkin notes are how Garth converts the starkness of his personal health battle into a way that parents can connect with their children, no matter what their circumstances. Meanwhile, he wakes up scared every day. Early morning is when Garth composes Emma’s napkin note. It is not a task he takes lightly. He searches for what thought, what idea, he wants to communicate to his daughter for that day. He searches for the right words. Sometimes they are his. Sometimes they are borrowed from others. Even in the days before his diagnosis, Garth placed a special importance on this early-morning time. It was a moment to pause and consider how to connect with Emma. How to have a shared moment with her in the middle of the day, even if she was at school and he was at work. But cancer has deepened this moment to the point where it is sacrosanct. As Garth says, in finding the right words for Emma, he is also finding the right words for himself. Finding his way forward for one more day, knocking cancer down on the to-do list, choosing to live in the place where things matter most, with Lissa and Emma, on the other side of fear.